Hourglass vs. Hydroxycut Max! for Women presents a showdown between 2 fat burners specifically designed for women. Hourglass uses a smart design to promote thermogenesis, metabolism, appetite control, blood sugar balance, energy production, exercise performance and overall health. In contrast, Hydroxycut Max! for Women uses a proprietary blend to help women simultaneously burn fat while maintaining healthy hair, skin and nails. But which formula will actually provide safe and sustainable fat loss for women? Let’s find out in this review. Hourglass and Hydroxycut Max! for Women are both built to initiate faster fat-burning for women. How are the formulas of Hourglass vs. Hydroxycut Max! for Women similar? Hourglass and Hydroxycut Max! for Women are both fat burners specifically designed for weight loss in women. However, despite their similar promised effects, the two fat burners don’t have any ingredients in common. How are the formulas of Hourglass vs. Hydroxycut Max! for Women different? Every ingredient in Hourglass and Hydroxycut Max! for Women is different. Furthermore, Hourglass provides better forms and higher dosages of its ingredients compared to Hydroxycut Max! for Women. In addition, Hourglass explicitly states the dosages of each ingredient on its label. Hydroxycut Max! for Women, on the other hand, doesn’t list dosages for most of its ingredients, which we don’t necessarily like. Along with Hourglass’s potent ingredient dosages, its superior ingredient forms play a vital role in the overall potency and synergy of the entire supplement. It uses branded ingredients and standardized herbs, making it a safe and effective formula for women. Hourglass’s synergistic formula has the potential to initiate sustainable fat loss for women while helping them maintain a feminine physique. It also supports overall female health with ingredients including vital nutrients and research-backed fat busters. Not to mention, its ingredients are optimized for advanced absorption in the body, unlike Hydroxycut. Hydroxycut Max! for Women contains more ingredients than Hourglass. However, its ingredients are not provided in the best available forms. In fact, Hydroxycut Max! for Women only contains one standardized herb; the rest include plain, plant-based extracts, simple nutrients and caffeine anhydrous. In addition, the dosages of most ingredients found in Hydroxycut Max! for Women are hidden in a proprietary blend. This may make you wonder which ingredients are working: is it the caffeine, other ingredients, or just a placebo effect? And we may never know because they don’t tell us the dosage of each ingredient. All in all, the ingredients in Hydroxycut Max! for Women’s aren’t very impressive in our eyes, seeing as they come in low dosages and unstandardized forms. Some of its ingredients can even be obtained from dietary sources like mango and kiwi. So, why consume a low-dose supplement instead of eating delicious fruits? Hourglass has a better formula compared to Hydroxycut Max! for Women because it provides better nutrients and better ingredient forms in unambiguous dosages. Hydroxycut Max! for Women contains various unnecessary ingredients considering the benefits it claims to initiate, making it another run-of-the-mill weight loss supplement. Clean Label No. Other ingredients include: Gelatin, Vegetable Stearate, Natural Yellow (Turmeric) Color. No. Other ingredients include: Sesame Oil, Capsule (Gelatin, FD&C Red No. 40). Advanced Delivery No. Plain gelatin capsules. No. Plain rapid-release liquid capsules. Stim-Free Yes No. It contains Caffeine Anhydrous. 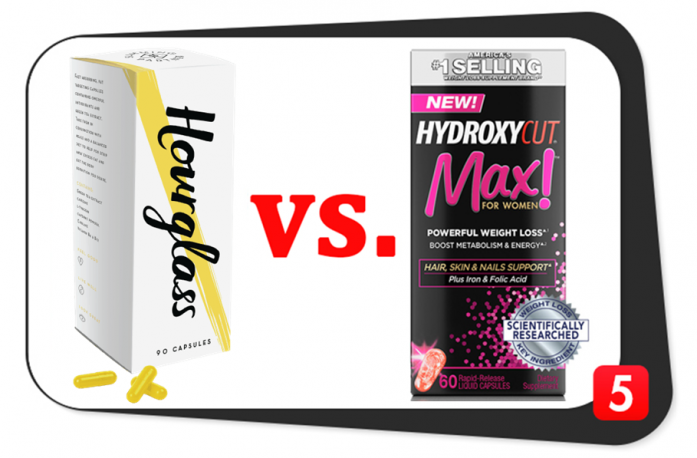 Hourglass clearly has more ingredients of notable quality compared to Hydroxycut Max! for Women. For example, Hydroxycut Max! for Women mainly relies on caffeine to deliver its fat-burning benefits. 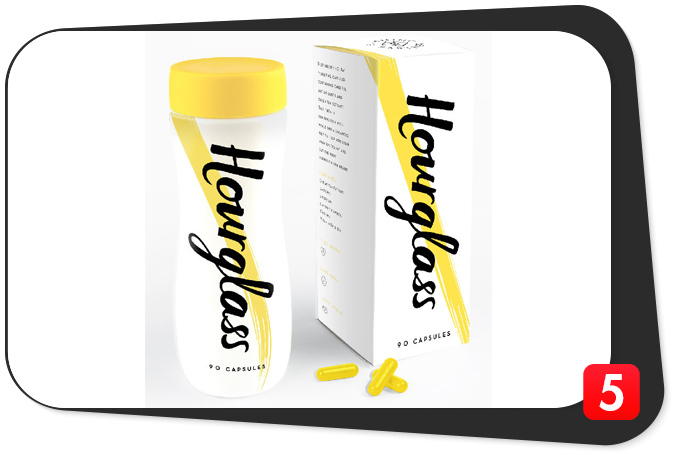 Hourglass uses potent dosages of essential nutrients like vitamin B6 and vitamin B12 to initiate its fat-burning effects. While Hydroxycut Max! for Women does contain a few essential nutrients, these nutrients don’t come in advanced forms and their dosages are quite low, except for biotin (Vitamin B7) and caffeine. In addition, Hourglass uses plain gelatin capsules containing a natural colorant while Hydroxycut Max! for Women uses rapid-release liquid capsules containing some synthetic additives. Even though Hydroxycut Max! for Women uses rapid-release liquid capsules, these don’t necessarily increase the absorption or synergy of its ingredients. Thus, it’s mostly for show. Hydroxycut Max! for Women contains mostly plain plant extracts and stimulants that don’t live up to the belly fat busting formula we were hoping for. So, while it may be $20 cheaper than Hourglass, it certainly isn’t as effective. In addition, the Hydroxycut Max! for Women formula isn’t actually so unique to female fat-burning; men can get the same benefits from its ingredients. Regardless, it seems to have sacrificed quality of ingredients to be a cheaper fat burner. The price of Hourglass comes from www.hourglassfit.com in 2018. This is the only place to buy Hourglass because it is sold exclusively by the manufacturers. Thus, you won’t find it on Amazon or GNC if you’re looking for a better deal. In contrast, you can shop for a better deal on Hydroxycut Max! for Women via Bodybuilding.com, Walmart and iHerb. Different retailers may or may not offer better prices. In terms of pricing, Hydroxycut Max! for Women is cheaper than Hourglass. However, Hydroxycut Max! for Women only offers plain plant extracts and one standardized herb while Hourglass offers various standardized herbs and branded ingredients. In addition, Hydroxycut Max! for Women doesn’t contain many research-backed fat burners compared to Hourglass; therefore, it’s more of a simple, experimental fat-burning formula. The low-dosage proprietary blend of Hydroxycut Max! for Women hides most of its ingredient dosages, making it less transparent and less effective overall. In other words, Hourglass may be worth the higher price. Hourglass vs. Hydroxycut Max! for Women: Which is Better? It’s obvious to us that Hourglass is a better overall fat burner than Hydroxycut Max! for Women. After all, the only advantage Hydroxycut Max! for Women has over Hourglass is its lower price, which may be that way because it’s less effective. Hourglass contains fewer ingredients compared to Hydroxycut Max! for Women. However, its ingredient forms and dosages have been carefully selected to provide safe, sustainable and significant weight loss results for women. In contrast, Hydroxycut Max! for Women is full of filler ingredients to make their nutrition facts better. Yet the only truly active ingredients in it are caffeine anhydrous and Robusta coffee extract. Overall, Hourglass wins this showdown with its high-quality ingredient selection in effective dosages. Hourglass is also well-tolerated when digested; so women will be less likely to experience unwanted side effects. If you’re looking for more information on fat burners and how they work, check out our guides on the best fat burners of 2018 and the best fat burners for women.